Former Nigeria international, Emmanuel Amuneke, has been appointed the new technical manager of Tanzania after the gaffer was handed a whooping two years deal. The 47-year-old on Monday, signed a two-year deal, to take over from Salum Mayanga. 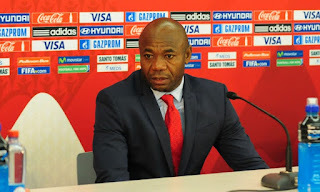 Amuneke’s first task will be to get the Taifa Stars’ Africa Cup of Nations qualifying campaign back on track. The East Africans are third in Group L, having being held to a 1-1 home draw by Lesotho. Tanzania had hired and parted ways with four different coaches since 2014. Amuneke will make his bow when Tanzania face Uganda in an Africa Cup of Nations qualifying clash on September 7, 2018.